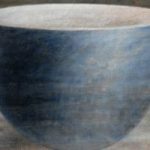 Peter White studied at Edinburgh College of Art and has lived and worked in North-West Scotland for the last twenty years. 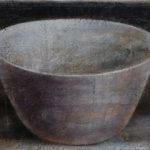 He has exhibited widely in Scotland and the UK and his work is in many prominent collections including the Fleming Foundation and the Royal Bank of Scotland. 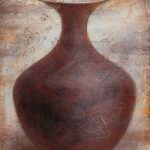 His paintings are built up by a meticulous layering process incorporating, acrylic, oil paint, wax and chalk, the surface is scraped back and more layers applied the final image emerging from this process in an almost archaeological way. Peter’s simple forms – empty vessels, open books discarded caps and garments are resonant with metaphor which he insists cannot be pinned down. ‘I prefer not to write about my work’, he explains ‘because they are archetypes not illustrations and the meaning is not specific, influences come from within it is not just a process of seeing and absorbing’. 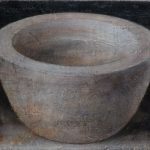 The paintings allude to history and memory, alchemy and the process of transformation and the palette and texture surely bare reference to the Scottish landscape of his home.